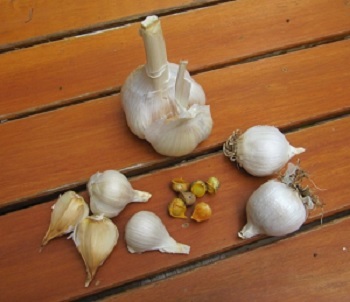 Cloves, bulblets and rounds - the 3 ways to plant garlic. Garlic may be one of the best foods/herbs to eat to help against infectious diseases like cold and flu. Fresh garlic is also a potent antibacterial, antiviral and anti-fungal agent. But its therapeutic effects may go much further than that. At least part of garlic’s therapeutic effect comes from its sulfur-containing compounds, such as allicin, that give it its characteristic smell. Other health-promoting compounds include oligosaccharides, arginine-rich proteins, selenium and flavonoids. Fresh cloves must be crushed or chopped in order to stimulate the release of an enzyme called alliinase, which in turn catalyzes the formation of allicin. Allicin in turn rapidly breaks down to form a number of different organosulfur compounds. So to “activate” garlic’s medicinal properties, compress fresh cloves with a spoon prior to eating or put them through your juicer to add to your vegetable juice. Allicin, is destroyed within one hour of smashing the garlic cloves, so garlic pills may be worthless. Some of the supermarket-brands containing garlic powder imported from China can be contaminated with high levels of lead, arsenic and added sulfites, according to a recent article by PreventDisease.com. Decrease the amount of garlic if odor becomes a problem. If garlic makes you feel ill, it may be your body's way of letting you know you should avoid it. Other things that will help fight colds and flu include the following: Vitamin D is a potent antimicrobial agent making you far less susceptible to contracting colds, influenza, and other respiratory infections. The most common way cold and flu viruses are spread is via hand-to-hand contact, so the easiest way to cut down your risk is to frequently wash your hands. Other lifestyle factors that can depress your immune system, alone or in combination, include - eating too much sugar and grains as well as lack of sleep. Don’t make the mistake of using antibacterial cleansers, as their widespread use contributes to strains of resistant bacteria, or "superbugs" that render antibiotics useless. Another strategy is to administer a few drops of 3% hydrogen peroxide (H2O2) into ear canals. Quite frequently, people claim to have been able to cure a cold or flu within 12 to 14 hours this way. Simply put a few drops into your ear; wait until the bubbling and stinging subside (usually 5 to 10 minutes), then drain onto a tissue and repeat with the other ear. This also helps with ear wax buildup. You may have noticed that I did not recommend taking flu shots. and receive an opportunity to get wonderful GIFTS.